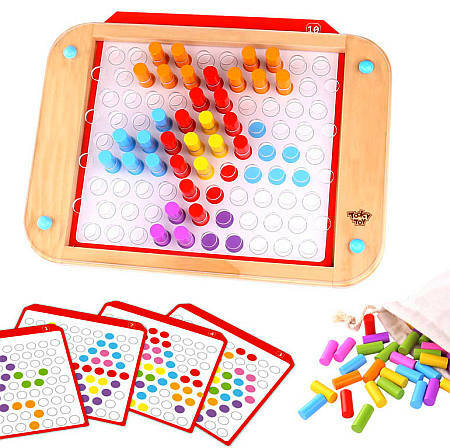 Wooden Peg Pattern Game is a well thought out matching and sorting game which teaches colour and shape recognition. This lovely toy game has a wooden base covered with a perspex sheet. A supplied card with a pattern on it can be slotted between the base and perspex. The perspex has holes cut into it where pegs can be place to match the colour dots on the card beneath. This set comes with 84 coloured pegs in 7 different colours so patterns can get quite complex. A well made solid toy this is perfect for fine motor skills, learning colours and matching. This matching game can also be used without the cards to make intricate patterns. Teaching opportunities abound with this toy such as "make a pattern using only red and yellow." or "make a red triangle". Material: Wood childsafe paint, perspex. We like this because: "A wonderfully inventive toy with massive learning and play opportunities. " The Wagon Walkers arrived Wednesday in good order. Thank you. I remember our children having a similar but lesser quality cart they played with for years. It was mended & reinforced several times. So I was very pleased with the wagon walker & know it will provide many years of constructive play. Everyone is very impressed with the quality & our Grandson immediately began building blocks & pushing the cart around the kitchen with a big grin on his face. A real winner.